Dr. Joseph P Turk, MD is a Doctor primarily located in Thousand Oaks, CA, with another office in Simi Valley, CA. He has 20 years of experience. His specialties include Adult Reconstructive Orthopaedic Surgery and Orthopaedic Surgery. He speaks English. Dr. Turk has received 4 awards. The overall average patient rating of Dr. Joseph P Turk is Great. Dr. Joseph P Turk has been rated by 40 patients. From those 40 patients 13 of those left a comment along with their rating. The overall rating for Dr. Joseph P Turk is 4.0 of 5.0 stars. I have been seeing Dr. Joseph Turk about my joints pain since 2012, trying out alternatives to surgery. Since nothing else has worked, I returned to him earlier this year (2019) to discuss the matter. Despite his brusque, no-nonsense style of communication, he helped me overcome my fear of surgery and won over my trust and confidence. Six weeks ago he did my knee replacement. I have some joint pain - which is natural for such a major sugery - but I am able to walk around without a cane or pain killers. Dr. Turk is an excellent surgeon who is completely devoted to his surgery - and he will tell you as much. He takes immense pride in his work, and he excels at it. I had no pain during the surgery, and no nausea from the anasthesia later. Two weeks after the surgery when I visited the clinic to have the staples removed, he insisted that I look at the X-rays of my knee with the metal implant. I will have to say that I was impressed by the neatness and precision of what I saw. Dr. Turk has a no-nonsense style which may appear unsympethetic to some. But I have not found him unsympathetic or uncaring. He will tell you that he is a surgeon, and that is what he does. That is his passion. That is exactly what I sought: a surgeon whose expertise I could trust. Dr. Turk is an outstanding surgeon. Ask him questions about the surgery and he will provide you with all the information you want. He is very confident about his ability, and as I have learned from conversations with the hospital medical staff and his past patients - with good reason. And, as for responding to my patient's needs and answering my long list of questions, he has done a good job with that. He has answered every question I have asked to my satisfaction. He has listened to my concerns and doubts. With his confidence in his surgical expertise he helped overcome my fears and doubts. Six weeks past the surgery my recovery is solid and steady. I would highly recommend Dr. Joseph Turk for any joint surgery. I went to see Dr Turk to have go over an mri. There was a mix up.. Dr. Turk immediately made me feel like I was to blame. When I tried to explain myself he was dismissive and aggressive, which he also tried to turn that on me.. putting his hands in prayer position and repeatedly saying I'm not raising my voice . I really dont know what was going on.. but I really felt bullied and left in tears. I was not combative, although I did feel the need to defend myself... it was truly a horrible experience. This man did not even realize he was talking to a 62 yr. Woman who came to him in pain looking for advice. Instead it was like he was scolding the enemy! A total knee replacement within tears and very little discomfort. Dr Turk is a highly skilled and my surgery was far easier than I expected and the results better than I thought possible. He was caring and fussy about details and rehabilitation. I'd do it again in a minute if I had to. If you're looking for a doctor to hold your hand & pet you, this isn't your guy. He doesn't suffer fools gladly. But if you want the best surgeon in the state of California, Dr. Turk is the one. I had hip replacement on both hips at the same time. I'm 70 years old. It's not been quite 2 months and I'm practically back to better than normal - I can drive, I can go to my exercise classes, I can clean my own house and mow my own lawn. This doctor is an artist. I would highly recommend him to anyone. Joseph P. Turk, MD has been with Ventura Orthopedics since 2005. A native Californian, Dr Turk was raised on the San Francisco Peninsula. He travelled south to UCLA for his undergraduate studies where he received his Bachelors degree in Biological Sciences. Before pursuing his graduate and medical education, he travelled to West Africa where he worked for UNICEF. He received his Masters degree with honors in Medical Imaging Sciences from the Chicago Medical School and continued at CMS for his medical degree, also with honors. It was then on to Philadelphia, PA where Dr Turk completed his General Surgery internship and Orthopedic Surgery residency at the University of Pennsylvania (www.upenn.edu). There he was fortunate enough to work with multiple adult hip and knee reconstruction innovators and gained experience in a busy trauma center. Dr Turk's efforts brought him distinguished recognition when he received the residency program's Leonard Marmor Excellence in Arthritis Surgery award. Having found joint replacement surgery of particular interest, Dr Turk pursued an additional year of adult hip and knee reconstructive surgery in the fellowship program at the esteemed Anderson Orthopaedic Clinic in Alexandria, VA (www.aori.org). His mentors are truly recognized globally as leaders in joint replacement innovation. With his training behind him, it was time to return to California. While Dr Turk brings to Ventura Orthopedics his expertise in primary hip and knee replacement as well as complex revision surgery, his practice also includes both adult and pediatric trauma and fractures as well as arthroscopy and general orthopedic surgery. Dr Turk has contributed to chapters in textbooks and multiple orthopedic journals, made presentations at the American Academy of Orthopaedic Surgeons, and has spoken regularly at community educational programs. He also acts as assistant team physician to two Simi Valley high school football teams. Dr Turk is a board certified orthopedic surgeon with The American Board of Orthopaedic Surgeons and a candidate member of the American Academy of Orthopaedic Surgeons. He maintains office hours in both Thousand Oaks and Simi Valley and is on staff at multiple hospitals in Ventura County. Dr Turk makes his home in Ventura County with his wife and two sons. 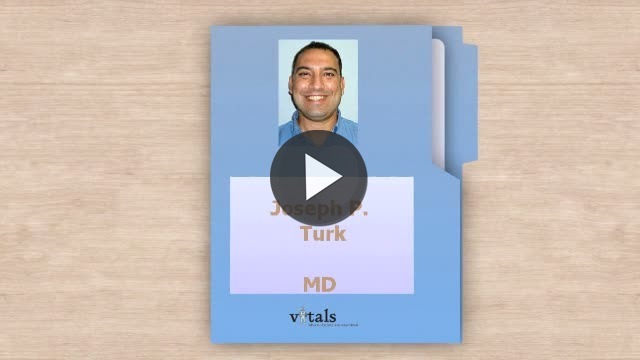 Take a minute to learn about Dr. Joseph P Turk, MD - Adult Reconstructive Orthopaedic Surgery in Thousand Oaks, CA, in this video. Dr. Joseph P Turk is similar to the following 4 Doctors near Thousand Oaks, CA. Have you had a recent visit with Dr. Joseph P Turk? Select a star to let us know how it was.